His Royal Highness has a broad national and international engagement. Youth leadership and global development are issues particularly close to his heart. Since 2003, Crown Prince Haakon has been Goodwill Ambassador for the UNDP – today focusing in particular on the Sustainable Development Goals. He is co-founder of Global Dignity, and is actively engaged in The Crown Prince and Crown Princess’s Humanitarian Fund. The fund identifies and supports projects for young people at risk and aims to strengthen youth leadership. As heir to the Norwegian throne, the Crown Prince has an extensive number of official engagements in Norway, and is patron of various associations. Every year, he is leading Norwegian delegations abroad to strengthen bilateral relations within trade and industry, science, and humanitarian fields. He has also represented Norway in the UN. Over several years, the Crown Prince has had a special interest in development issues, in particular the role of technology and how innovation can contribute to move the world forward. Crown Prince Haakon graduated from the Norwegian Naval Academy in 1995. He holds a BA in Political Science from the University of California at Berkeley and a Master’s in Development Studies from the London School of Economics. The Crown Prince is a passionate surfer, kiter, and music lover. He lives in Asker, outside Oslo, with the Crown Princess and their children. 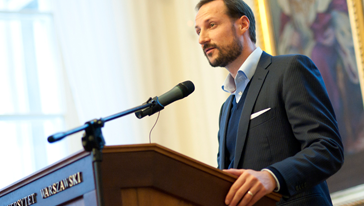 The Crown Prince Haakon of Norway described the MDGs and their priority target to halve the proportion of people living in extreme poverty by 2015. He stressed the progress achieved so far in bringing at least 400 million people out of extreme poverty compared to 1990. On a global scale the poverty rate in developing countries decreased from 46 to 27%. According to the Prince Haakon also the primary education improved among boys and girls, the number of new HIV infections is going down. The Crown Prince described most thoroughly the goal related to child mortality which aims at decreasing the rate by two thirds by 2015. Twenty years ago over 12 million children before the age of 5 were dying annually from preventable diseases. In 2010 this number decreased to 7.5 million. This presents an obvious progress however we will most probably not achieve this goal by 2015 – said the Crown Prince.